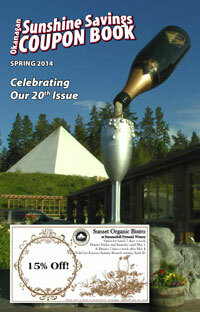 Distributed to thousands of Kelowna and West Kelowna homes! Entrepreneur Judy Levine has successfully produced The Okanagan Sunshine Savings Coupon Book since 2007. 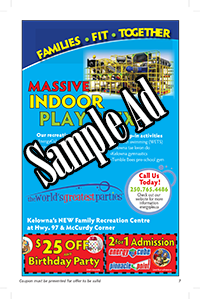 Over 50,000 printed copies of this Kelowna area coupon book are distributed through Canada Post to individual homes in Kelowna, West Kelowna and Winfield & Oyama twice a year. This coupon book is exceedingly popular and Judy receives many phone calls for extra books and constant enquiries about when the next issue is coming out! In keeping up with the times, we also offer online coupons in addition to the books, for those who choose that very popular venue for a small extra fee per issue. The Okanagan Sunshine Savings Coupon Book is a superb advertising venue, providing great branding and exposure to help Kelowna, West Kelowna and Winfield/Oyama businesses promote their products and/or services. A large percentage of consumers consistently collect coupons to help defray some of the costs of their purchases whenever they can. Therefore since the majority of area homes receive their free copy through the mail, the probabilities that many of those homeowners will leaf through and use the Okanagan Sunshine Savings Coupon Book are quite high! An attractive glossy publication, each issue of the Okanagan Sunshine Savings Coupon Book normally showcases over 50 Kelowna area businesses. Because of its range of businesses and variety of discounts offered, readers tend to keep the book around for easy reference and possible savings for an extended period of time. With a great track record and distribution three times a year since 2007, the Okanagan Sunshine Savings Coupon Book is proven to be an effective means of promoting Kelowna businesses. As of 2019, we have changed our publication to two issues per year, extending the shelf-life of the booklet as well as of the online coupons even more! Contact Judy Levine today to find out how YOU TOO can advertise in this coupon publication! Watch for the Next Issue - coming out shortly! Are you looking for a great coupon book loaded with area business information and savings? Watch for our next issue which will be coming out within the next few days! Our clients can now double their exposure with our ONLINE COUPONS! Check out some of our past issues to see samples of the kind of savings you can enjoy!